LIC New Money Back Policy 20 years is a Non-Linked Plan, which provides protection against death during policy term and payment on survival periodically at specified duration during the term. The LIC Money Back Plan 20 years (820) is an Endowment Plan, released on 6th January 2014 as per the guidelines of IRDA. The Insured of LIC New Money Back Plan 20 years will get the Sum Assured at regular intervals such as 5th, 10th & 15th policy year. The Total Policy Term is for 20 years, and the Insured need to pay for 15 years. The LIC Money Back Policy Calculator is provided by us to calculate the premium amount and maturity amount. The Plan provides Maturity and Survival Benefits to the Life Assured. A Lump sum amount will be paid after death or a particular term. At the end of the Policy Term, the Life Assured will get the Sum Assured along with Simple Reversionary Bonus. Accidental Death and Disability Benefit Rider is provided in this LIC New Money Back Plan 20 years. As Survival Benefit, 20% of sum assured is paid on the 5th, 10th and 15th year of the Policy. Death Benefit: If the Life Assured dies within the policy term, the Nominee is provided with the Sum Assured as Death Benefit. The Sum Assured along with Simple Reversionary Bonuses and Final Additional Bonus is offered to the Nominee. The Sum Assured is 10 times the annualized premium or 125% of the Basic Sum Assured. Survival Benefit: If the Life Insured survives till the end of the specified durations, 20% of the Basic Sum Assured is provided on the 5th, 10th & 15th Policy year. Maturity Benefit: On Survival of the Policyholder till the end of Policy, the remaining 40% of the Basic Sum Assured along with vested Simple Reversionary Bonuses and Final Additional Bonus is provided to the Life Assured. The Life Assured can select the Accidental Death and Disability Benefit Rider which is optional. By Payment of additional premium, this Rider can have opted which is available throughout the Policy term. During Accidental Death, the Accident Benefit Sum Assured along with death benefit is provided to the Nominee. In the case of permanent disability due to the accident, the Accident Benefit Sum Assured will be paid in monthly installments for 10 years. The Future Accident Benefit Sum Assured Premiums will be waived off. Maximum Entry Age Can opt at any time during the premium payment term. Minimum Accident Benefit Sum Assured Rs 1,00,000/-. Maximum Accident Benefit Sum Assured Amount equal to Basic Sum Assured, which is subjected to a maximum of Rs 50,00,000/- of overall limit. 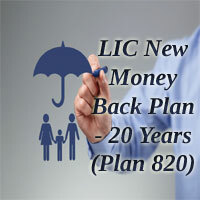 There is two bonus available for LIC New Money Back Plan 20 years. They are. Simple Reversionary Bonus: At the end of each financial year, the Simple Reversionary Bonus is declared per thousand of sum assured. The Bonus is accured during the premium paying term but paid at the time of death or end of the term also with a final additional bonus. Final Additional Bonus: If the policy is run for a specified minimum period, the additional bonus will be paid. It is Provided at the time of Maturity or Death. Loan Facility: The Life Assured can avail the Loan Facility under this Plan. Risk Coverage: This option is available until the end of the Policy Term. Riders: The LIC Money Back Plan 20 years has rider option facility. Cooling off period: The Policy can be returned within 15 days if the Life Insured is not satisfied with the Terms and Conditions of the policy. Suicide Clause: If the Life Assured commits suicide within 12 months, 80% of the premium paid will be returned. Housing Loan Surety: The Policy Holder can avail the Housing Loan Surety. Policy Revival: The Policy can be revived within 2 years from the date of first unpaid premium. Nominations/Assignments: The LIC Money Back Policy 20 years provides Assignments and Nominations in this plan. From Rs 2,00,000/- to Rs 4,95,000/- For every 1,000 Rs/- Sum Assured 2.00 Rs/- rebate. From Rs 5,00,000/- and above For every 1,000 Rs/- Sum Assured 3.00 Rs/- rebate. The LIC New Money Back Plan 20 years policy is available at all the branches of Life Insurance Corporation. He/She must visit the nearest branch of LIC to buy the Policy. The Branch Locator is made available below with all the necessary details. The Policy can also be obtained from the LIC Agent. The Policyholder can buy the policy through Online if unable can also buy the LIC Money Back Policy 20 years by Branch Visiting or through the LIC Agent. The Documents required are. The Life Assured/Nominee can apply for Claim if the sudden death occurs or after the completion of the Policy Term. The Claim Amount will be paid by the LIC Corporation. The necessary documents are to be submitted at the time of Claim Process. The LIC Money Back Plan 20 years Claim forms are listed below. The Premium can be calculated monthly, quarterly, half-yearly and yearly. The Premium details such as Maturity amount, Bonus and other can be obtained from the LIC Money Back Policy Calculator. What Happens if the Policy Holder stops paying a premium? Ans. The Policy will be lapsed if the premium is not paid within the grace period. The Policy acquires a Paid up value for reduced sum assured if the premiums have been paid for 3 years least. The Policy would be eligible for any future regular additions. The policy can be revived within 2 years from the date of first unpaid premium. 2. What are the bonuses available in the LIC New Money Back Plan 20 years? Ans. The Simple Reversionary Bonus and Additional Bonus are provided to the Life Assured. 3. Want to Surrender the New Money Back Policy 20 years? A. When the policy acquires Cash Value after paying the premiums for 3 years, the plan can be surrendered. The Percentage depends on the Policy Year and Policy Term in which the policy is surrendered as per the table.